Want to be notified of new releases in amritajain/swagger-graphene? This library can be used to convert Swagger schema into dynamic Graphene models. The system can be deloyed on AWS using Serverless framework and can serve GraphQL based queries instantly. Some examples elaborting the conversion of Swagger Schema into GraphQL API. This model is derived from the default PetStore example on swagger.io and has three fields: id, name, age. This library can be used to build dynamic Graphene models, which are then deployed to AWS, making your API ready to be used for GraphQL based queries. The image below shows an example of query executed against this simple schema. Open data/databse.csv and edit it to provide the information about your APIs in csv format. 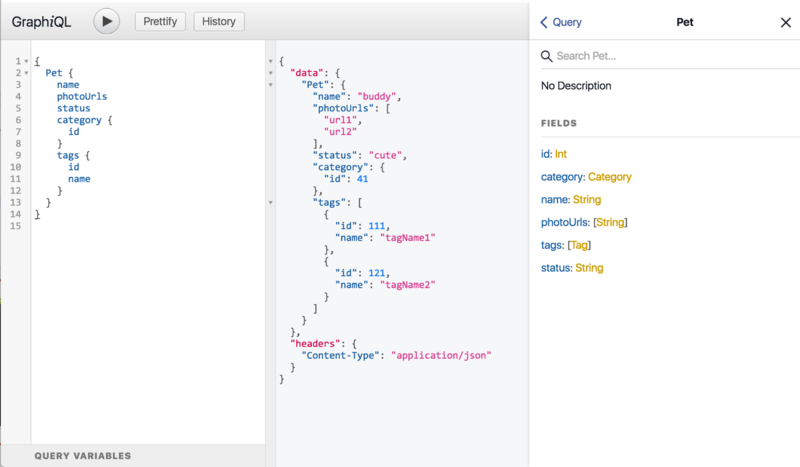 Root entity: This would be the root node of GraphQL query or API resource. Swagger souce url: Provide the endpoint for Swagger schema definition. You would need AWS's account id and a S3 bucket. >A valid file to satisfy the declaration 'file(serverless.env.yml):prod.env' could not be found. 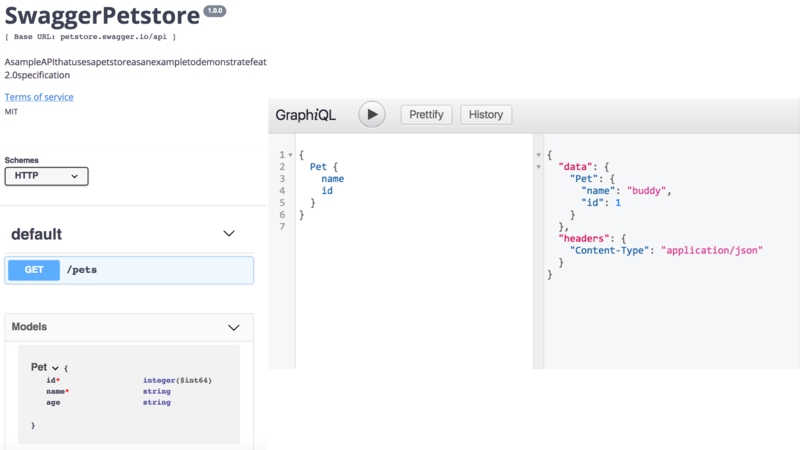 GraphiQL Use the API gateway url generated as GraphQL Endpoint in GraphiQL to run queries on the API. Tests are under tests/unittests folder and can be run using pytest or directly via PyCharm.